Sitto woke up very early in the morning to mix her dough on baking days. She used a big blue roasting pan and loved to feel the dough come together between her hands. Once the dough had risen properly, she set to dividing it up for the tasks at hand—the flatbread, the talami, the fatayar. By mid-afternoon the work was done, and there was always leftover dough. My mother stretched the balls into flat ovals and pushed a hole in the center of each one, making a rustic donut that she fried to a deep golden brown and sprinkled, immediately, with sugar from the sugar bowl. Then we ate them, immediately, until they were gone. I can’t say that any ingredient makes these donuts Lebanese. No rosewater, no cinnamon. I can’t even say that I know of other Lebanese families who fry the remains of dough at the end of a baking day. The donuts are Lebanese because they have always punctuated our Lebanese bread baking with a sweet, airy exclamation point. It strikes me now that there was always a heap of dough “left over” for the donuts, enough for everyone to have at least one. If we must steal from the loaves of talami or flatbread to gain for the donuts, then so be it. We’re in the layup now to Lent, with Mardi Gras next Tuesday. Thoughts of the austerity program have begun to creep in, and a serious sugar/alcohol/fat binge in the coming days is going to be necessary to tide me over for the next 40 days. You may just want to go ahead and unsubscribe from the blog at this point because for several weeks there will be only healthy, hearty Lenten food here…I do promise, though, that what we’re lacking in sweet we’ll make up for in savory flavor. Necessity is the mother of invention, right? Besides, they said to fast, not to starve. I haven’t gotten through many a Fat Tuesday without eating donuts for breakfast in some shape or form; Chicago was big on the pazcki, and those rich, jam-filled puffs went down easy at my desk between meetings. No doubt I showed up at the conference room table with sugar-rimmed lips, blindly thinking nobody would know what I’d just shoved in my mouth in seconds flat behind closed doors. Here in Harbor Springs, the pillowy sugared donuts at Johan’s Bakery will no doubt try to call me by name on Fat Tuesday. But I’m going to kick-off Lent with my own donuts by rearranging Sitto’s baking order of the day, and I don’t think she would mind: fried dough first. Wait a minute—how about donuts with all of the dough? It’s the least we can do to help Fat Tuesday live up to its name. These donuts are best eaten immediately after they are fried. Proof the yeast by dissolving it in ½ cup water with a teaspoon of the sugar and letting it activate for about 15 minutes, or until its creamy and little bubbles are forming. Whisk together the remaining 1/3 cup sugar, flour and salt. Create a well in the center and add the oil and proofed yeast mixture. Slowly work the wet ingredients into the dry, adding the 3/4 cup water slowly. Hold back ¼ cup and only as necessary to create a soft dough. Knead the dough gently for just a couple of minutes. Coat the dough with about 1 tablespoon of oil, cover with plastic wrap and a kitchen towel, and let rise in a warm spot until doubled, about 2 hours. Divide the dough into 8-10 balls. Let rise, covered with plastic wrap and a kitchen towel, on a lightly floured work surface for 20 minutes. Fill a medium sauté pan with enough canola oil to reach 1/3 of the way up. Heat over medium high heat until a tiny ball of dough placed in the oil bubbles up immediately. Be careful not to over heat the oil, or the donuts will brown too quickly and will not cook through the inside. Stretch three balls of dough at a time into rustic, oblong shapes and poke a hole in the middle. 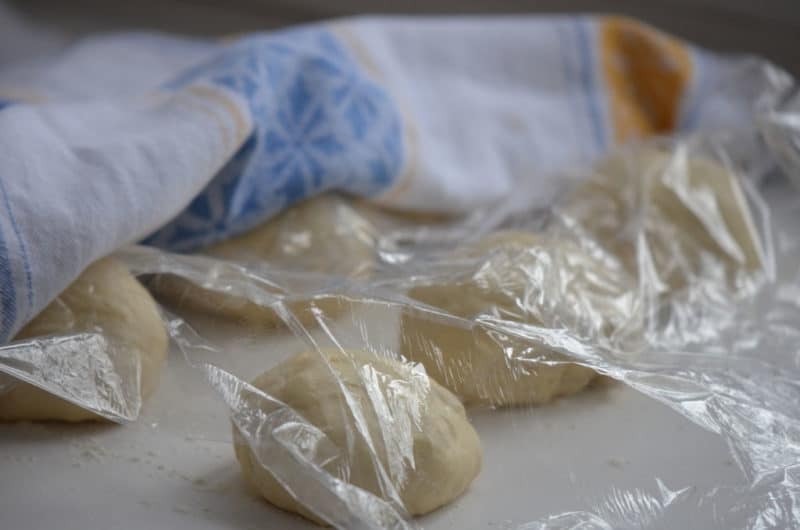 Keep the rest of the dough balls covered to prevent them from drying out and forming a skin. Fry three donuts at a time, turning over with tongs when deep golden brown. Transfer to a plate lined with paper towel, and sprinkle with sugar while they’re still hot, and enjoy. 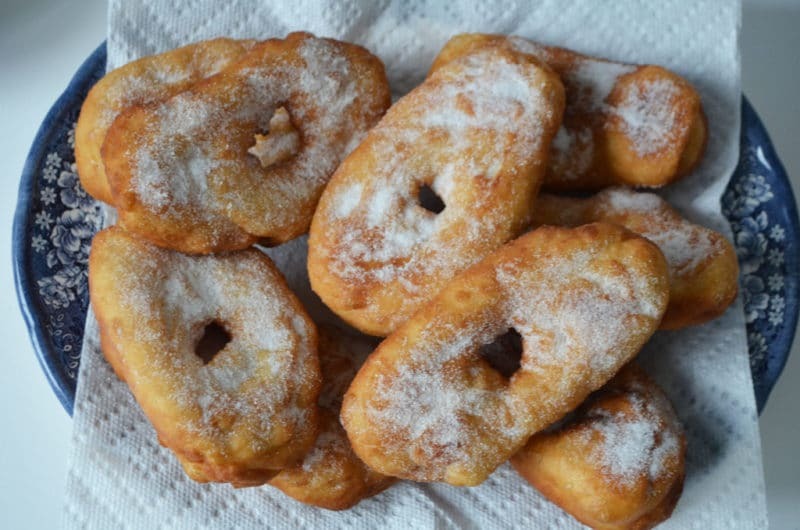 52 Responses to "Lebanese Sugared Donuts: our pazcki, our beignet, our Fat Tuesday"
Maureen, we made “zalabia” all the time! That was our word for fried sugared dough. My sithee made them for us and I remember making them for an international food day in 7th grade. Definitely am convinced that many cultures fry and sugar dough. It seems a universal good, no? Ah yes, zalabia, the donuts for Epiphany. Those typically have more going on than these very simple donuts, but sounds like your Sitti considered all fried dough zalabia? Love how you showed 7th grade a Lebanese delight!!! These doughnuts are beautiful, Maureen, so much prettier, and no doubt tastier than anything from a Krispy Kreme or supermarket bakery. Italians are also fond of frying leftover dough, even pizza dough, and sprinkling it either with salt or with powdered sugar. I had never heard about pazckis until I moved to Detroit. I liked them alright, but to my mind nothing beats a simple ring of fried yeasty dough rolled in sugar and enjoyed while still warm. Oh–and I AM looking forward to your Lenten posts! Thank you Domenica, and I love your Italian leftover dough fry. I will try it with salt, sounds delicious!! Your doughnut tale evokes 2 of my favorite breads. French bakers saved scraps of dough after scaling the day’s work, gently combined them and baked them off at the end of the day. This dough was typically very strong from slight overfermentation so they would add ingredients such as olive oil and herbs to complement that flavor. The result was Fougasse, a dense, chewy flat bread that allowed bakers to practice their decorative shaping without wasting dough. 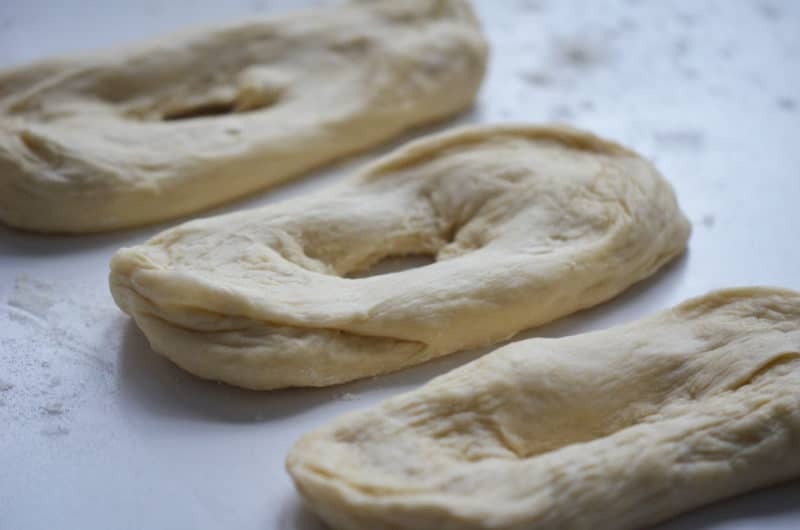 Many bakers are now mixing special doughs for Fougasse, a bit of a snub to the real tradition. The second bread is Native American frybread which you will see in abundance at a Native American Ghost Supper (or the Harbor Springs PowWow). It is typically made from a quick bread recipe rather than yeast and frequently uses powdered milk, again a nod to frugality. Can’t beat fried dough! 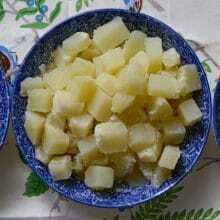 While thinking “fried in oil” I just remembered cauliflower florets fried light brown in hot oil and slightly salted. No one did that except my mother, one day I fried up a mess myself and ate the whole head of cauliflower. Of course it wasn’t lent. And yes I was sorry for eating all that. And it made a mess, I cleaned it up but my wife didn’t think I did such a good job. Great memories! Jerry, lots of us are thinking of the zalabia, the syrup-dipped fritters–so delicious and traditional of Epiphany. I bet your Sitto was quite a cook. And how great that you made the cauliflower–I blogged about fried cauliflower here because it is SO delicious and, as you say, you can’t stop eating it. Worth the messy kitchen!! We also made “zalabia” with the leftover dough. This brought back such wonderful memories of me as a child baking with my Sittu!!!! I shared your story with my daughter who now lives in NY and she asked why I wasn’t making them for her!!!! Jody, how great! Please give your daughter my regards, and thanks so much for joining me here! 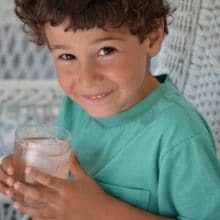 Your name is very interesting–are both Namey and Atty Lebanese? Yes, my Mom’s family were Audi-Charles, my Dad’s Namey. My husband, Atty (Atiyeh)! My mother was mostly English and she made fried dough regularly. Didn’t attempt to make it look like a doughnut, just hunks of dough thrown in the pan. It wasn’t “left over” because she made a whole batch of dough just for frying. I thought it must be a farm country thing since my city cousins marveled at the idea when they came to visit. They ate the results down without hesitation and bragged to their mothers about how great a cook “Aunt Nora” was and they wanted to come back to visit more often.The mothers asked for the recipe and couldn’t believe the kids raved over plain dough. I think it was because they had never tasted hot bread of any kind right out of the oven and the sugar (both granular and powdered) tasted better on hot bread rather than just cold doughnuts from the store. She also made “pull apart” bread. She would take dough and make rods of dough a length equaling the width of the pan. Put them in side by side to fill the pan, then allow it to rise and bake it as a normal loaf. When it came out of the oven the “slices” would pull apart where the rods of dough had met. It was great hot out of the oven with butter and jelly and somehow tasted better than regular loaves that had to be cut with a knife. Nothing like a good country visit to teach the city cousins how to eat!! Great story Roger, thank you. I want to make that pull apart bread, sounds really soft and good. Hi Cousin Jody!!!! So nice to see you here!!! And Jody, YOU are an Abowd too, by marriage–Ferris’s maternal grandmother, also my maternal grandmother, was an Abowd, Jamileh Abowd, from Ammun, Lebanon. E-mail me, I will tell you what I know. Hi to Cousin Ferris! Maureen, you make me laugh so hard–I know you can hear me all the way from NM. My Sitto never made these delicious fried breads, nor did my Mother, so I have definitely missed out. But I hope to make these some day. I will get my niece Gabrielle, the real chef in the family, to help me. Peace and Love to you all! My gosh, I just love all of these family connections!!!! And what names: Jamileh, Gabrielle, beautiful. I also love thinking of you laughing there in your house in NM, Diane. The thought made me laugh too! Hi Diane! I emailed Maureen & told her about our connection…small world!! Yes, a most wondrous and loving small world! Jerry, my mother made cauliflower florets as you describe–we had it almost every Friday with fish–I LOVED the cauliflower, and none of my Lebanese aunts ever made it either–I never knew if it was Lebanese style or if my Mother just made it up. YUM! Thanks for the memories! It’s SO Lebanese! Fried cauliflower is in all of my Lebanese cookbooks. You just can’t beat it for deliciousness. My mom & sittu made it every Friday also!!! Love you Dear Cousins Maureen and Jody!! Who would have ever thought we could talk with one another instantaneously on three different points of the lower 48, and have never even yet met! And all about fried cauliflower! Maureen, as Cousin Charlie Abowd says, ‘One way we show our love is through our food!’ What a beautiful culture. I am so happy to be Lebanese, AND to be part of the Abowd clan (however which way it is spelled)! Blessings! I have been making these all my love. They are my kids favorit as well as my lawn cleaner and every pastor we hae had. You must eat them at once though. Looking fords er to your Lenten meals. My Aunt Sara! How special to see you here!! Thank you for reading and telling us about your fried dough, which is no doubt absolutely delicious and perfect–I’ve been thinking of you often and send you my love. Mom sends her love to you too. Looks like you hit the jackpot with this Lebanese Donut. Many of us grew up having “fried bread” with left over dough from our mothers and Sitto’s. We do it a lot for special occasions for the grandchildren. They love it. Zalabia is made special for Epiphany, the fried dough/bread is simply as you say, left over dough from bread, talami, or or fatayer. Yummmm…..
Janet, thanks for sharing your fried bread memories…I love that it’s still made in your house! Fried bread was always such a treat when mom made syrian (flat) bread, the smell of the dough and warmth of the kitchen in the early morning, she would just flatten out the balls or stretch a bit not making them necessarily round and then put the hole in the middle. One day while making these for my grandkids my husband asked me why I put the hole in the middle and I said……. “because my mother did”…… so he asked Mom and she said ….. “because my mother did” and now that is a joke around our house. Whenever I go to see my grandchildren or they are coming to our house the first thing they ask is “are we having fried bread for breakfast?” and the answer is always “yes”. 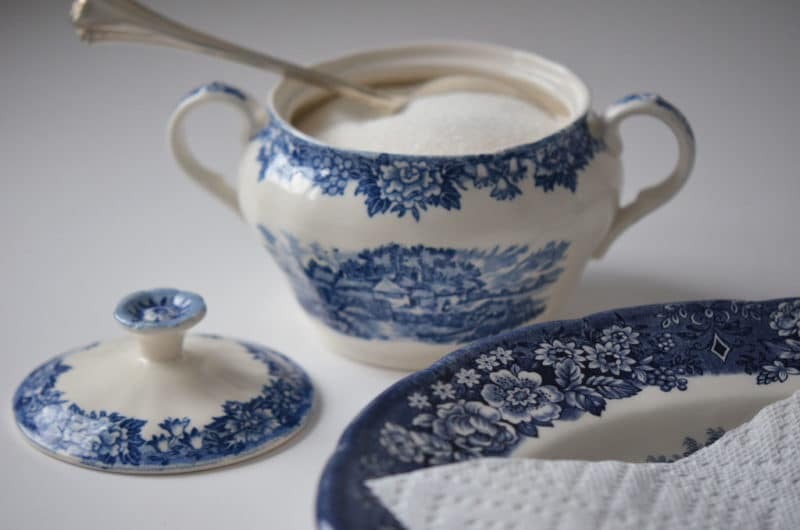 We grew up breaking off small pieces and dipping them in jelly but have added shaking them in sugar or now cinnamon and sugar. Thank you for this wonderful site, you’re bringing so many memories to so many of us. That is beautiful Geri!! I love the idea of tearing off the bread and dipping in jam…must try it…thank you thank you for sharing. What a woman, baking bread in high heels!!!! For three days!! Thank you so very much for sharing this, Mary. A beautiful memory. My sitti makes a version of these! We always called them “Dip the Dough” in English because we dip them in maple syrup – instead of sprinkling with sugar. I just found your blog through a link at The Kitchn to your Lebanese “white coffee”. I work at the Arab American National Museum in Dearborn, and we are planning to do a food exhibit sometime in the near-ish future. We’d love to work with you on programming if you’re available! Elizabeth, this is just great! 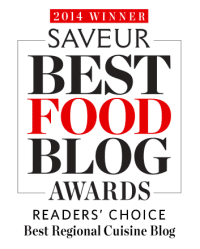 Thanks for linking over from the fabulous site at The Kitchn. I would love to connect with you about your food exhibit in Dearborn–please let me know! All the best, and thank you for sharing your Sitti’s ‘dip the dough,’ which sound really good dipped in syrup…. Both of my grandmothers were from Jdeidet Marjeyoun, Lebanon so made the same version of zalabia. Only they made theirs with a little sugar in the dough and anise seeds. Some of the doughnuts were shaken in a bag of sugar and some were glazed with a simple syrup of, not rose water, but orange blossom. And these batches of zalabia were not made from left over dough or just around Easter but upon the slightest family request. We ate them all the time. And then the unthinkable happened. Our Sitty’s passed and with them the recipe. Sitti’s recipes are gone? Noooo!! I love that version with anise and glazed, a bit different than the straight fried dough here. I have friends also from Marjeyoun, not far from my family’s village of Dier Mimas. Thanks for writing, Matt! Thanks Janet , this brought back so many memories, I’m going to make these for my grand kids on Sito Saturday this week. Hello Suzanne, and thank you for asking about zalabiya! I promise to publish that here at some point, so stay tuned! First of all, I love your website and look forward to the email notifications. I have shared with my family members on our family Facebook page so that all can enjoy the wonderful memories and recipes. 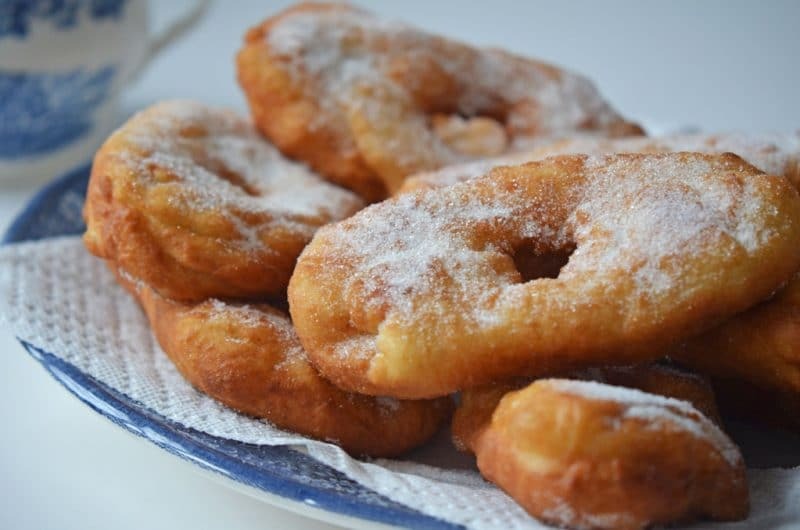 I enjoyed following this thread on fried dough and kept looking for – and finally saw – someone mention what fried dough meant in our family. Zalabia was always dough with anise seed. My mother would give them a nice “twist” before placing in hot oil. We ate them hot from the skillet, dipped in maple syrup. Like Matt, we were lucky in that she would make them for us periodically for no reason and it was always a special day! My brother has carried on the tradition with his family, making them as a treat when one of his grown kids return for a visit. By the way, my father’s mother was known as Francina Faye Tannous Moussa Abboud in the old country. She was born in Ain Kfaa, Byblos District, Lebanon in 1889. She became Rose Francina Faye Thomas in America. She married Boutros Mikhayel (Peter Michael), born in Ghalboun, Lebanon in 1879. I’m thinking we must be related on my paternal grandmother’s side, Maureen! Carry on your great story telling and recipe sharing! My family members were particularly touched by your recent take on “A family is really a collection of stories.” We so identified with that profound thought. Cousin! Wow, what a wonderful comment–thank you so much for sharing, and for your kind words. And how special that you know the details of your clan in Lebanon. Zalabia with anise is a treat. Please keep in touch Karen! Thanks, Maureen (cousin). My nephew Christopher Mikhayel has been fortunate to live as a musician in Beirut in recent years and, with the help of cousins who still live there, has been able to visit the villages where all four of our grandparents lived, and learn their histories from visiting churches and finding other records there. It’s been a real wonderful thing for us. I hope to visit some day. By the way, although a proud Ohioan and OSU grad, I think the state of Michigan is beautiful and abundant with good things (not including the Spartans and Wolverines). 🙂 And I love Harbor Springs. you do live in paradise! we call this zalebee and it’s not a leftover, it’s a rare labor of love because it’s made for breakfast, so the cook has to get up super early to make the dough and let it rise. Ours are differently shaped blobs, too… not exactly doughnut shaped, but definitely with holes. Dipped in sugar while hot. mmmmm! I’m so glad I found your site today. My Sitto made these every Christmas morning. The only difference is that she did her dough the night before, put it in a pot, wrapped a blanket around it and set it in front of the dying fireplace over night. I would wake up to the smell of fried dough on Christmas morning and bypass all presents just to grab one right after it was dipped in sugar. Thanks for posting this, can’t wait to try it! Just beautiful Jamie, thank you! Wow, what wonderful history, Jolynn, thank you! I see that this is a re-post but it’s the first time I’ve seen it. And, it makes me nostalgic remembering how we, my sisters and I, looked forward to a breakfast of “fried dough” the morning after mom made bread. A more recent memory is a few short years ago I could easily get my grandsons to visit me with a promise of fried bread. It may not be a healthy thing, but it’s a good thing. A VERY good thing Elaine! Wonderful memory–thanks for sharing! My sitte and mom always made the zalabia on New Year’s day for good luck. We did not put a hole in the middle. She just pinched off a piece of dough, stretched it and put it in the oil. Once they came out of the pan we buttered them and sprinkled powdered sugar. They were amazing and we only ever seem to have them on New Year’s and when there was leftover dough from making the the Syrian bread. Such great memories! This is similar to a Sunday breakfast tradition prepared by my Syrian family (and taught to the multi-national spouses and children!) The dough recipe itself is essentially the same, save for the minor tweaks that makes each family’s recipe their own. We never made the hole in the middle, nor did we cover with sugar or dip in jam. Eggs or black olives were our accompaniment of choice. I’ve been trying to find out if this is a common thing, or another of our clan’s numerous quirks. It can be hard, at times, to track down the “real” names for the dishes I remember from my childhood. Talami was called talami (or Syrian bread), but fatayar became “flat tire.” My father called this fried bread “zobaggies”, though I have no idea if that’s close to a proper title, and I’m sure it’s far from a proper spelling. Regardless, thank you for the stories, and the additional stories in the comments. 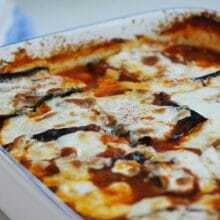 When next I find time to cook, I’ll try this version. Maybe I’ll have something new to share next time I visit the family. This is just wonderful James! Thank you!